dialogue | Randomwhoness: a Doctor Who blog by Johnny Spandrell. Sampling stories in random order. Doctor Who production office, late 1966. GERRY: (on phone) No, no, it’s the windjammer jacket, the blacked-up face and the Harpo Marx wig. No, he’s going to look great. Don’t let him out of the building. OK, marvellous. Thanks. Imperious knock on the door. GEOFFREY: Pray, good fellow! Grant me access to these… impoverished premises! Hangs up and opens door. There stands an imposing man, opera cape, wild hair, crazy eyes. GEOFFREY: Thank you, good man! Run and fetch the Script Editor, would you? GERRY: I’m the Script Editor. GEOFFREY: Good lord, you’re Mr Davies? GEOFFREY: Davies, I am the esteemed writer Geoffrey Orme! No doubt you’ve heard of me. I have written many high quality feature films and TV programs, enjoyed by the masses! GEOFFREY: And the good news is, I have decided to write for your children’s program, Mr Who! GEOFFREY: Now, Davies, I submitted a perfectly brilliant Mr Who script to you a good fortnight ago and yet I have heard nothing! Nothing! Me, the writer of What would you do, chums?, Ramsbottom Rides Again and no less than four Old Mother Riley films! GERRY: Oh right, Mr Orme. What was the name of that script again? GEOFFREY: Mr Who Under the Sea! GERRY: Oh yes, hang on, I’ve got my notes on it somewhere. GEOFFREY: Notes? Of sheer gobsmacked admiration, I trust! Haw haw haw! GERRY: (fishes the script out of the bin) Here it is. GEOFFREY: Misfiled, eh? You should sack your incompetent wretch of a secretary. GERRY: Yes… So, Mr Orme, thank you, but we will not be making your script. GEOFFREY: No! No! You cannot do this to me! You are turning me down? I, who wrote 6 episodes of Ivanhoe? I demand to know why! GERRY: Well, it doesn’t make any sense. GEOFFREY: So you’re just a little man after all, Davies, like all the rest. You disappoint me. GEOFFREY: But of course! The people there survived due to in air pockets in the mountain’s caves! But they long to lift Atlantis from the ocean. Make it dry land again! GERRY: They could just take the lift. GERRY: There’s a lift leading to the surface. If they wanted to be on the surface, they could do so whenever they want. Rebuild Atlantis there. And really, why would they stay hidden for thousands of years rather than rejoin humanity? Why not go and ask people on the surface for help to raise Atlantis? GERRY: Yes, that’s another thing. Zaroff wants to blow up the world, under the guise of raising Atlantis from the sea bed, but there’s no good reason why. GEOFFREY: Why? You, a script editor of a lowly children’s programme ask me why? The achievement, my dear Davies! The scientist’s dream of supreme power! GERRY: See, the mad scientist thing is a bit clichéd, Mr Orme and most scientists actually want to advance humanity. GEOFFREY: You are a fool! An idiot! GERRY: What about how all the Atlanteans live on plankton? GEOFFREY: What’s wrong with that? GERRY: They live in the ocean, Mr Orme! They are literally surrounded by seafood, yet they choose to eat plankton. And although they have the world’s greatest scientist living amongst them, and they have the technology to perform transformative surgery on human beings, they haven’t got any refrigerators. GEOFFREY: But that’s the genius of it, don’t you see? All the food goes bad in a few hours, and that’s what sparks the revolt which spells Zaroff’s downfall. That’s how Mr Who wins! GERRY: Look, it’s not Mr Who. The lead character’s name is the Doctor. And sometimes Dr Who when I want to mess with people. In any case, I just don’t think you’ve got the structure right. GEOFFREY: What do you mean, you little man? GERRY: You see in our show, Mr… I mean Dr Who wins through intelligence and ingenuity. In your script, the villain just tells the Doctor his plan at the start of Part Two. There’s nothing for him to work out if Zaroff gives the game away as soon as they meet. And the Doctor’s big plan to stop Zaroff destroying Altantis is to… destroy Atlantis. He might as well let Zaroff blow it up. GERRY: Well, exactly. In any case, I think it’s beyond our budget. It’s got a shark tank, an octopus and a whole underwater ballet with loads of floating fish people. We showed the script to one director and he ran away in panic. GEOFFREY: Just put flippers on some extras and hang them up via wires! I really think you’re making too much fuss about all this, Davies. A silly little children’s program doesn’t need to make any sense or look convincing! GEOFFREY: (In the corridor, shouting at closed door) The man is a fool. Have I not sworn to you that Atlantis shall rise again from the sea? Haven’t I? Haven’t I? What are you staring at? CLEANING LADY: Nothing. Nothing at all. GERRY: (on the phone) The t-shirts say what? Tell him it’s just a joke. No, don’t let him phone his agent, I’ll come down straight away. (Hangs up). Okay, thanks for coming in Mr Orme. I wanted to tell you that we will be producing your script for Doctor Who after all. GEOFFREY: Well, how delightfully wise of you, young Davies! You must have read the script again and realised what pure, unsullied genius it is! GERRY: Well, no. Another script fell through and as I’m writing the story before it and the one after, I just don’t have time to write this one as well. Frankly, it’s either your story or we put on reruns of… I don’t know, Ivanhoe. GEOFFREY: I wrote six episodes of Ivanhoe! GERRY: I know you wrote six episodes of Ivanhoe. Plus, we’ve found a director who didn’t have a conniption at the thought of making the thing, so we’re on. GERRY: Sure. Look, I don’t have time to do much rewriting on it, so just take on all the notes from our last meeting. Plus the octopus has got to become a fish and add a bit where the Doctor dresses up as a gypsy. Dressing up’s his new thing. And you’ll need to write in a new assistant, a Scots boy called Jamie. GEOFFREY: No problem there, good fellow. I’ll just give him some of Mr Who’s girlfriend’s lines. GERRY: Um, sure. And change the title. GEOFFREY: Yes! To Geoffrey Orme presents the extraordinary tale of Mr Who and the Fish People! GEOFFREY: Nothing in the world can stop me now! CLEANING LADY: Good for you, ducks. LINK TO Cold War: Setting, the sea. NEXT TIME: We get ensnared in The Web Planet. What galaxy is that in, Doctor? Could you pick a Doctor Who story’s writer from watching it with its credits lopped off? Well, you and I could of course, because we’ve got honorary PhDs in Who from Murwillumbah TAFE. But if for some reason, a new, unseen script fell through a vent in the space-time continuum, without its writers credit, could you pick the author? Seven Saward Signature Dialogue Tells. The short, heavily laden question. Consider his habit of giving characters concise, frank questions to elicit a response from another character. Often these questions try to fit in both a descriptive noun and and active verb. “The escape was prevented?” is an example. The line could be, “everything worked out fine” or “no harm was done”. But in Saward’s style, we find out two things: there was an escape and it failed. In one super efficient question! Answer one question with another. It’s particularly useful when you want to avoid giving an answer. But it’s more likely to be used as a kind of sarcastic rejoinder. DOCTOR: Would you care to take another look? Here’s a famous example from The Caves of Androzani. DOCTOR: You were expecting someone else? This one actually doesn’t turn up in Resurrection, which is remarkable because it’s widespread among stories written or script edited by Saward. It’s the habit of characters presenting the two sides a dilemma, with the second line starting with ‘neither’. Again, grammatically correct, but very clunky. The classic one’s in Revelation of the Daleks. GRIGORY: You can’t rush this sort of thing. NATASHA: Neither can we hang around here. DOCTOR: You must withdraw your men, they don’t stand a chance. BRIGGS: Neither will we if those things get up here. CURT: Neither is it Roman. BALAZAR: It would be murder to kill them. MERDEEN: Neither can I free them. DOCTOR: They weren’t hanging about. PERI: Neither did they look very pleased. I’d written this off as one of Saward’s idiosyncrasies. So imagine my delight when an corker example of Neither Fever turned up in Doomsday. ROSE: You didn’t need to kill him! 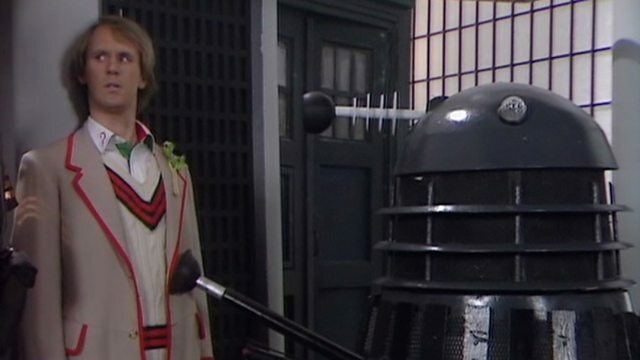 DALEK: Neither did we need him alive! Who would have thought it? Russell T Davies channeling Eric Saward! Lines which mean and add nothing. Pointless, aren’t they? The awkward way of saying something. In which one person makes an innocent remark and another turns it into a whinge about what they want. CALDER: Anyone want some tea? TEGAN: I’d much rather have the Colonel back. BRIGGS: You’ve done well, Mister. You’ll get an extra bonus. RINGWAY: I’d rather have Vance and Carson alive. DOCTOR: Merely slips of the tongue. PERI: I rather think they’re slips of the mind. KARA: Please, accept my apologies. DAVROS: I would sooner accept your money! At which point everyone laughs awkwardly, and the big mutant head in a jar trying to crack the funnies. Lines which conjure peculiarly vivid imagery. LINK TO: The End of Time. Both have flashback sequences! De rigeur for both the Davison and Tennant eras. NEXT TIME: Geronimo, allons y and Gallifrey stands, it’s The Day of the Doctor.